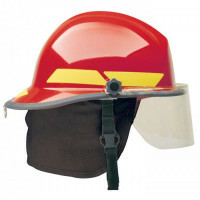 Fireman helmets are designed to give firefighters the extra edge that tips the odds in their favor. Featuring contemporary styling, these helmets incorporate recommendations from veteran fire professionals from around the world. The result is an intgrated assembly of advanced materials and quality components that provide outstanding head protection, superior comfort, long-lasting durability and proven on-the-job performance. Jual Helm Safety MSA Original USA. Tersedia Warna Putih, Biru, Kuning, Merah..